I sneak into the basement to get the goods that I’ve been hiding there since yesterday. 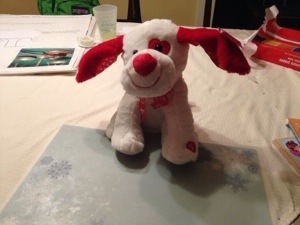 I place this guy at Brooke’s seat at the kitchen table. I take Katie’s flowers out of the vase they’ve been hiding in in the garage and attempt to dry them a bit before heading upstairs to wake her up with them in hand. Still holding Katie’s flowers and chocolate, I sneak into our bedroom to sign Luau’s card. 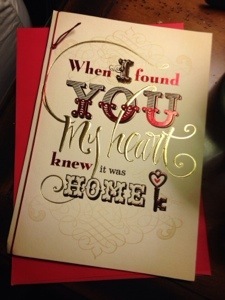 I hate “husband” Valentine’s Day cards — always have. But this one .. well, let’s just say that I might have cried just a little in CVS and that it kind of said exactly what I needed it to say. As I scramble to write the card (at 5:30 on Valentine’s morning, as you do), I hear Luau’s footsteps coming into the room. “Huh?” he says, perfectly reasonably, because, well, huh? “It’s just a card,” I say, feeling a little smug, cause, ya know, I did that. After finishing the card and now not-so-secretly hiding it on his pillow, I walk out into the hallway, passing my bathroom along the way. 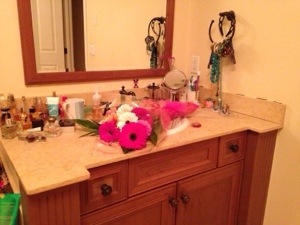 And there, on my sink, just like all the I love you’s that I’ve just scattered around the house, are these. “Where the heck did you manage to hide these last night?” I ask, grinning. His sarcastic answer is not fit to print. 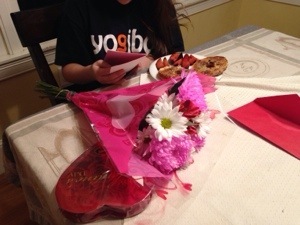 And that, my friends, is Valentine’s Day at the Wilson’s, 5:30 am. Wishing you and yours a very Happy Valentine’s Day. Or, as Brooke calls it, and I much prefer, Happy Hearts Day. May yours be full with love — and may it come, in its own messy, beautiful, glorious way, full circle. That card is amazing, Jess. …and Happy Hearts Day, too, of course! Happy Valentines day to all of you….you have such a beautiful family!! Beautiful card. And your running around the house with gifts reminds me of what i used to do when my girls were little. I can neither confirm nor deny that I swept a bunch of crap just out of view before snapping the picture. Maybe. Happy Valentine’s Day to my favorite family in the history of families. You guys rock. You get up early…I stayed up later than everyone to get my valentines in the right spots! We do what we have to do! Happy Hearts Day! AND TO ALL OF YOU TOO! What a lovely way to start a day!